It’s an essential part of our daily life that we often we take for granted. Color gives meaning and emotion to life, but it’s often the furthest thing from people’s minds. Believe it or not, professionals from around the world gather to chat and strategize about the ways color defines our lives. Color forecasting is the practice of predicting the colors and color stories that consumers will want to purchase in the near future. And it’s just not in the fashion realm where color is king: manufacturers in the automotive, home décor, consumer goods, materials, and even food industries use color forecasting. Professionals from all corners of the globe harness the power of their collective knowledge to predict which colors will be “in” two years from now. Companies use this wisdom for smarter design. They use color forecasting in packaging, signage, product design, and more. It informs the way companies talk to their customers, all without saying a word. Color forecasting gives people the power to communicate a mood or feeling that’s relevant to how consumers feel at a point in time. It’s a powerful strategy that makes messaging more effective. Although most people don’t give color a second thought, it can make or break a product, no matter the niche or industry. Color forecasting significantly influences product development. Instead of feeling sideswiped by unexpected changes in consumer taste, color forecasting lets companies plan ahead of fads. They have more time to purposely create a better product, which means happier customers and more revenue. Because color forecasting is done several years in advance, it lets companies offer their products to the right people, at the right time, with the best possible messaging. They’re able to meet buyers’ expectations with smarter design and more appealing features. Most companies don’t offer a single product; they have a slew of offerings that give their customers more choice. Color forecasting empowers companies with the color directions needed to design complementary products and services. For example, Samsung might use color forecasting to look at popular color palettes for the year 2022. Let’s say the color palette is called “Fiery Dusk,” which was designed from the worldwide obsession with space exploration and Mars missions. Samsung would use the colors in this palette to design phones, washers, refrigerators, and even smart home devices. Their products would appeal more to customers by evoking a mood of excitement, adventure, and innovation thanks to the color palette. 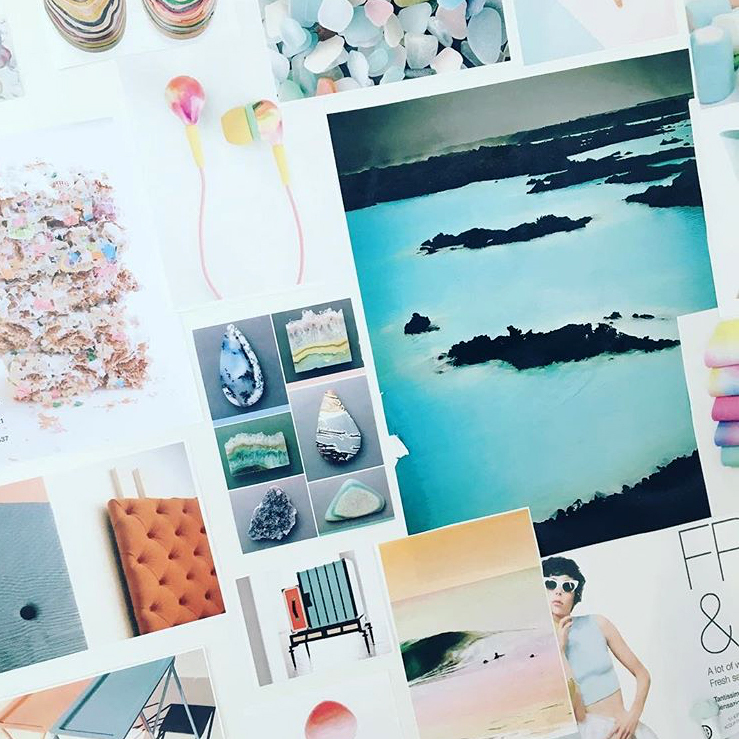 Color forecasting isn’t just about colors: it evokes a collective mood and state of being, which can be shared through the products we buy. Going on the previous example, the Fiery Dusk palette gives Samsung a competitive edge over companies that don’t use color forecasting. Think about it: If Joanna is buying a phone in 2022, is she going to be drawn to a boring white phone, or a sleek and innovative Samsung phone? Maybe she’ll be drawn to the white phone for a variety of other reasons, like her budget, but color forecasting makes Joanna stop in her tracks and evaluate the Samsung phone over other options. Companies significantly benefit from color forecasting because they can give customers what they want without the guesswork. Forecasting helps companies with their bottom line, no matter the industry. It also has a great benefit for consumers, too. If baby blue is the en vogue color, chances are you’re going to look for products in that color. You’ll be able to buy a computer, shoes, socks, coffee mugs, pens, and even cars in that color. And it’s all thanks to smart color forecasting. It’s about giving buyers the products they love to show the mood of the times. It sounds like an impossible dream to predict the colors that the world will love in a few years. How can you capture a sentiment from thousands of people – and convert it into a color? You’d do better just to list colors and grab them out of a hat, right? Color forecasting is comprised of all-important research, science, and testing. It’s both a highly technical practice and an art. Designers and color experts meet to collaborate on future color trends. They use research from field reports, consumer surveys, and product split tests as a quantitative basis as their starting point. From there, color forecasting becomes more of an art. Color designers delve into tradeshow research, news media, economic temperature, POP culture, and more to support emerging color stories two years ahead. They create mood boards, which are a collection of images, words, or art that evoke a certain emotion supporting the emerging color’s story. Several color stories reveal themselves during the research process. Once stories are discussed and agreed upon, colors and color names are selected as color directions that support the story. Once designers agree on the color directions, they’re used to make the all-important product decisions. Color, Materials, and Finishes (CMF) designers go a step further, creating certain finishes that complete their color stories, which they can use during the product design phase. For example, if designers picked royal purple as a popular color, they might assign “rounded edges” and “matte texture” as important attributes of their product design. The future of color forecasting. Color forecasting has existed in some form since the early 1800s. It started off simply, with books and dissertations on the nature of certain colors and their psychological impact, and the science of color. Color forecasting has now expanded into a critical communication tool that color design professionals use to speak to the world around us. Or, to put it more accurately, color forecasting helps us reflect the future state of the world, celebrating both its flaws and beauty. As more companies flock to the online space, color forecasting will continue to be a necessity for reaching the hearts of millions through better communication. You are very welcome – please keep reading as we have many more interesting and color-related articles coming up.